If you've got kids you know that sometimes the dark can get quite scary for them. To help ease them to sleep at night, make sure they have a night light. 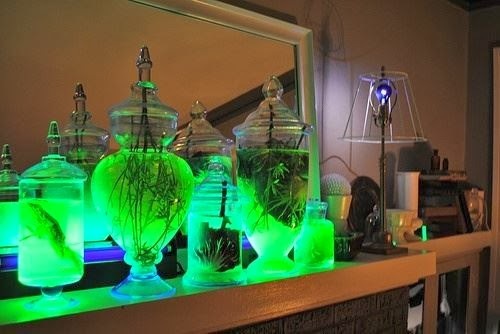 This is a neat way to make your own glow in the dark night light in whatever color they prefer! All you need is water, a jar and glow sticks. Warning: Glow sticks are dangerous and poisonous so do not let your children play with them on their own or during the process of making these. Buy a batch of glow sticks, and carefully! Glow sticks can be poisonous and dangerous. Take the broken glow sticks and mix them into each container. These would be amazing for a little boy or little girl's room! The picture above uses highlighter liquid and fake plants/animals. Let the highlighter and water sit overnight and then take out the highlighter insides out of the water which leaves you with glowing liquid. These fairy or firefly jars are super easy to make as well! 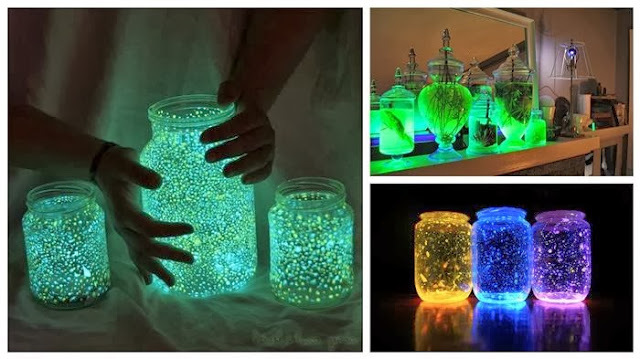 Cut open the glow stick and shake it into the jar, add diamond glitter and shake it all up.